HONOLULU – The Hawaii Department of Transportation (HDOT) will make pavement marking adjustments to Kamehameha Highway between the Kipapa Stream (Roosevelt) Bridge and Lanikuhana Avenue to increase motorist, bicyclist, and pedestrian safety. These improvements are anticipated to be completed by September/October 2018 and will be implemented by the contractor for the Kipapa Stream Bridge Rehabilitation project to reduce the need for additional lane closures. 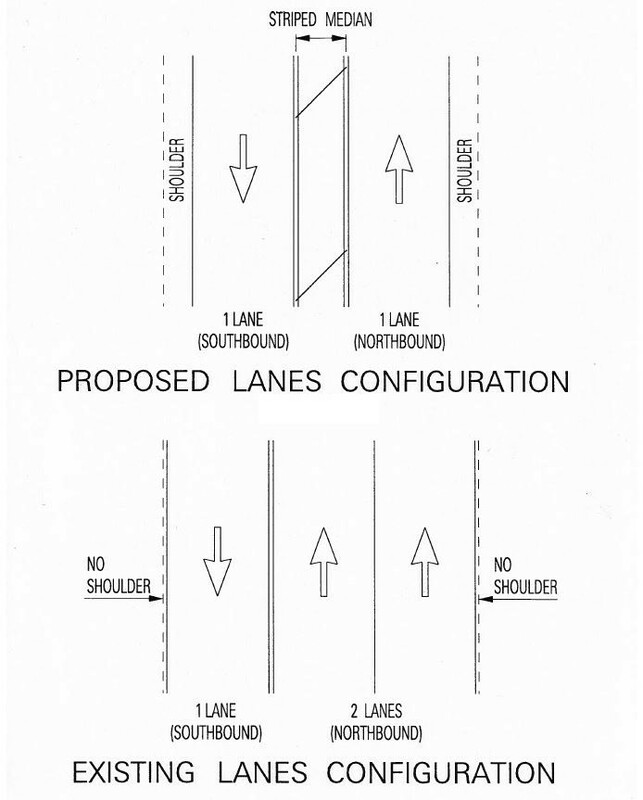 Currently, the roadway north of the bridge consists of three 11-foot travel lanes (two northbound lanes and one southbound lane) and 0- to 4-foot shoulders. The roadway will be restriped to accommodate two 11-foot travel lanes (one northbound lane and one southbound lane), a 3- to 6-foot median, and 4- to 6.5-foot shoulders. The Kipapa Stream Bridge Rehabilitation project scope of work includes overhang extension work to widen the bridge, which will allow HDOT to make these adjustments to the bridge. See conceptual drawings below. The wider median would increase safety on the route by reducing the risk of head-on collisions, and the wider shoulders would provide space for motorists needing to attend to emergencies while keeping travel lanes clear. Between 2012 and 2016 there were 13 motor vehicle crashes due to a vehicle crossing over the center line on the north side of the bridge (which does not currently have a median) vs. four on the south side of the bridge (which does have a striped median). 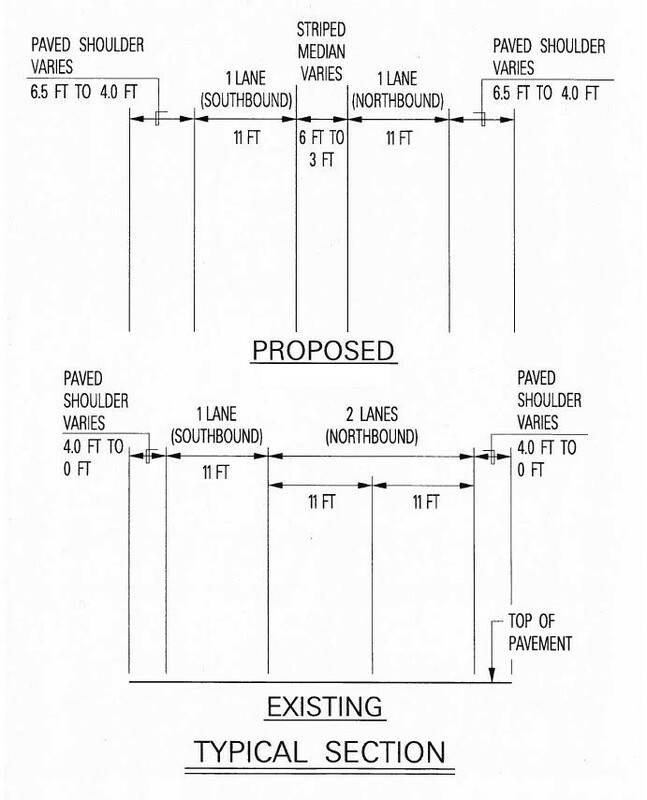 Wider shoulders in this area would also improve bike and pedestrian connectivity for central Oahu as these road users are not allowed on the alternate roadway in the area, the H-2 Freeway. Sniffen presented the proposal to the Mililani-Waipio Neighborhood Board on March 28, 2018, and HDOT collected 67 public comments during the month-long comment period. 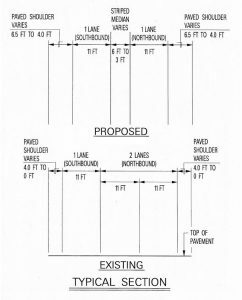 These comments were split by a 2 to 1 ratio with 45 road users in favor of the safety improvements and 22 in favor of retaining the original lane striping. HDOT conducted a traffic study to determine the average travel time if a northbound lane was closed on Kamehameha Highway between Ka Uka Boulevard and Lanikuhana Avenue. In March 2018, baseline data (two northbound lanes open) was collected during the peak afternoon travel time, 3:30 p.m. to 6 p.m. In April 2018, the left northbound lane was closed, and data was collected over a two-day period during the same timeframe. 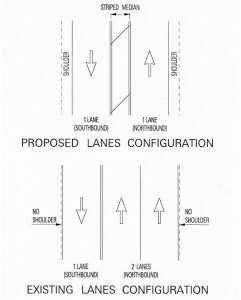 The closure of the left lane would mimic the configuration if the area was restriped, providing one northbound lane and one southbound lane. Following the completion of the study, HDOT found that the traffic volumes on Kamehameha Highway were slightly higher on the demonstration days; however, this did not have a significant impact on travel times. The average travel time from Ka Uka Boulevard to 0.2 miles before Lanikuhana Avenue was approximately 25 seconds longer than the average travel time collected for the baseline data, and vehicles were able to maintain speeds of 30-45 miles per hour. The posted speed limit along Kamehameha Highway between Ka Uka Boulevard and the Kipapa Stream Bridge is 35 miles per hour and from Kipapa Stream Bridge to Lanikuhana Avenue is 45 miles per hour. Volumes on the H-2 Freeway were consistent with prior years. To view the results from the traffic study, click here.